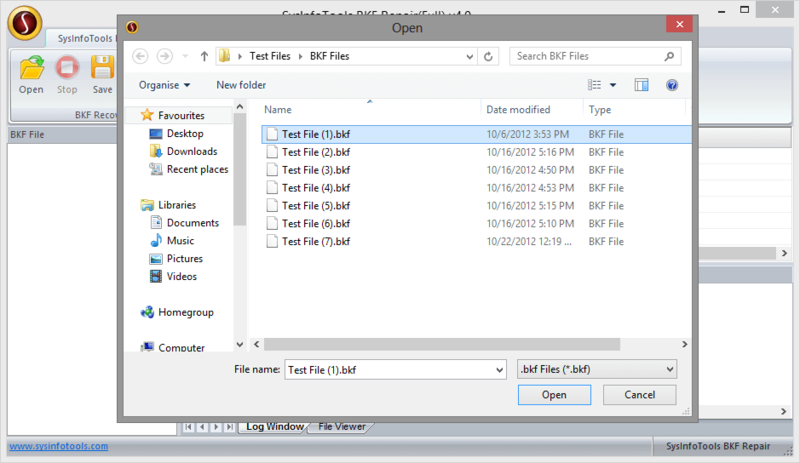 SysInfoTools offers you a freeware program to open BKF file named as free BKF File Viewer. It permits to open, read or view Windows Backup BKF file without any data loss. The software fixes all corruption issues and allows you to open unreadable BKF file and open them on Windows platforms. The free BKF file Viewer software helps in opening of a BKF file according to the data range and save it as log file as a .txt format. Being file viewer, it doesn't allow you to extract data from BKF file, it only previews the data file within the windows backup file. BKF Viewer software tested on any size of BKF file that might include any type of file like any document file(word, PDF, PPT, Excel), image, database file, and etc. for opening without any data loss. It successfully runs on every platform of Windows including win10, win7 and other previous versions.